Today has been one of those days that makes me happy to be alive and outside! The sun was shining, the temperature was in the high 50s, people were biking and running and walking their dog with a renewed sense of vigor (probably because of the realization that bikini season is sneaking up on them). For the first time this year, it finally felt like spring was just around the corner and winter was over. That is more than enough to make me happy, as we all know how much I hate winter. When I lived in Miami and had never even seen a snowflake, let alone experienced below freezing temperatures, I used to think winter would be a nice and welcome change from the constant Miami temperature of always-burn-in-hell hot. Then last year, I experienced maybe two very small snowfalls in my first year in Ohio (in case you’re wondering, it was a very fluke winter with no precipitation). It was enough for me to start wondering if winter was for me, though. This year, even though there’s hardly been any snow here either, I KNOW it’s not for me. Everything in the winter becomes tiresome and tedious. You can’t take the dog out for afternoon walks, or at least it’s not appetizing, because its like 20 degrees Fahrenheit at 6 pm and its pitch black outside. Driving is a pain in the a– because there’s snow or ice in the road. You can’t go anywhere that might require you to be more than 5 seconds outside. Even grocery shopping is a pain because you have to walk 50 feet from the store to the car to load the food. I can go on and on about the inconvenience of winter. But today, none of that mattered because for the first time this year I went outside without wishing to stick my entire body in an oven. In fact, this whole weekend was perfect. Sunny, no wind, not too hot and not too cold, what more could anyone possibly ask for? 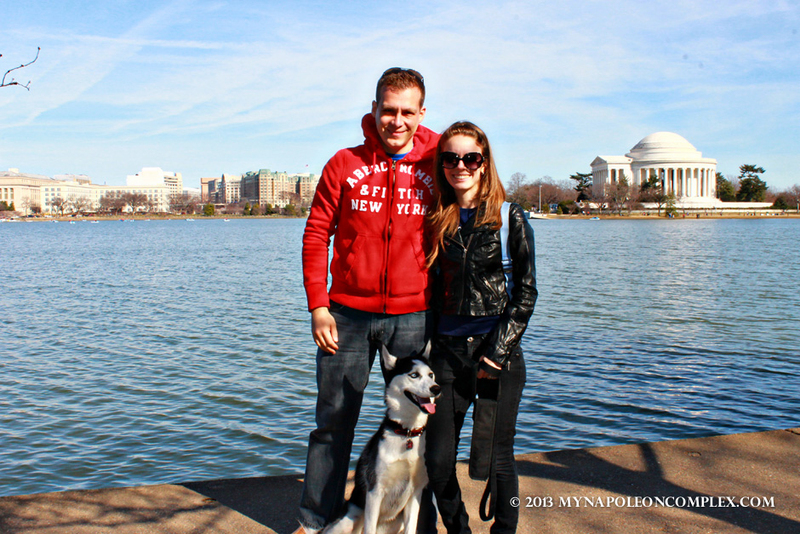 Jaime, Arya, & I in front of Tidal Basin. So Jaime and I took the opportunity to finally enjoy some of Washington from the outside instead of running from one indoor shelter to another. Yesterday, we went to the National Museum of American History for a bit, but we left without finishing because we were so anxious to get outside and walk around (a big perk when the museum is free and you know you have another few months to finish it). For those of you that don’t know, the American History museum has THE flag that inspired Francis Scott Key to write the Star-Spangled Banner during the War of 1814 and the display is amazing. The coolest part for me was that he wrote it on September 14th, which is my birthday! 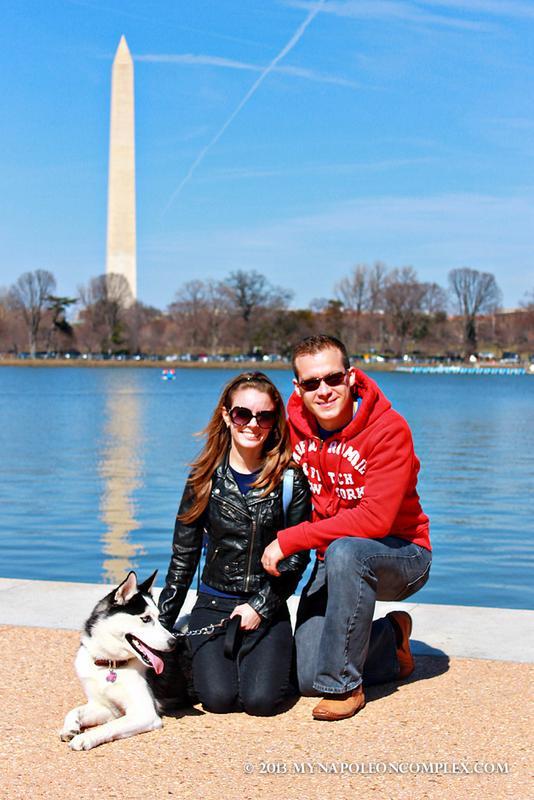 Today, we took Arya, our ten-month Siberian Husky, out around the Washington mall. 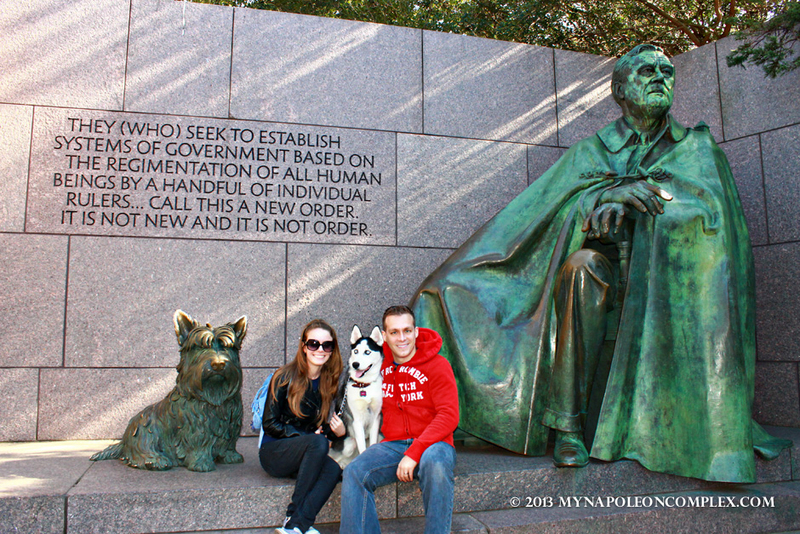 We went to the Jefferson Memorial and the Roosevelt Memorial. After being stuck inside for the better part of three months due to the weather and how busy we had been with the preparations for the move, Arya was ecstatic. She jumped on people, got everyone’s attention, probably angered quite a few of her fellow canines, and even took a picture with Roosevelt’s dog! 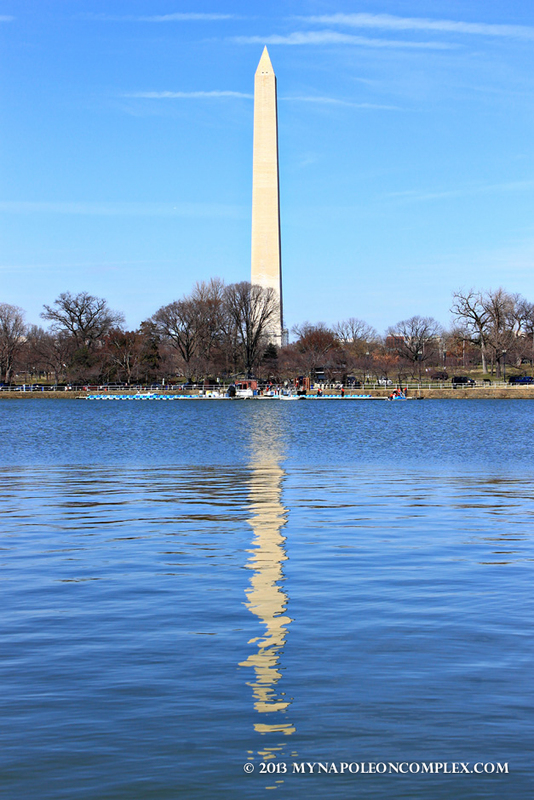 Note that while you can take your dog around the FDR memorial and around Tidal Basin, you can’t actually ascent the steps into the Jefferson Memorial. 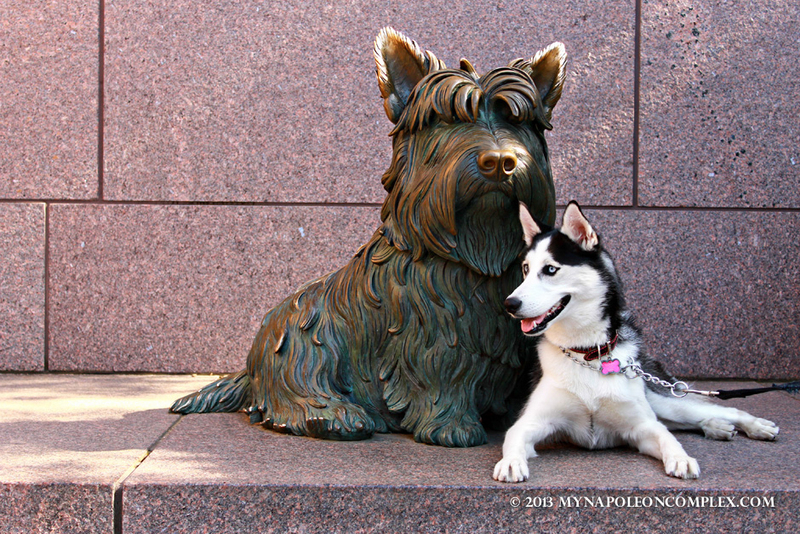 Arya and FDR’s dog, Fala. 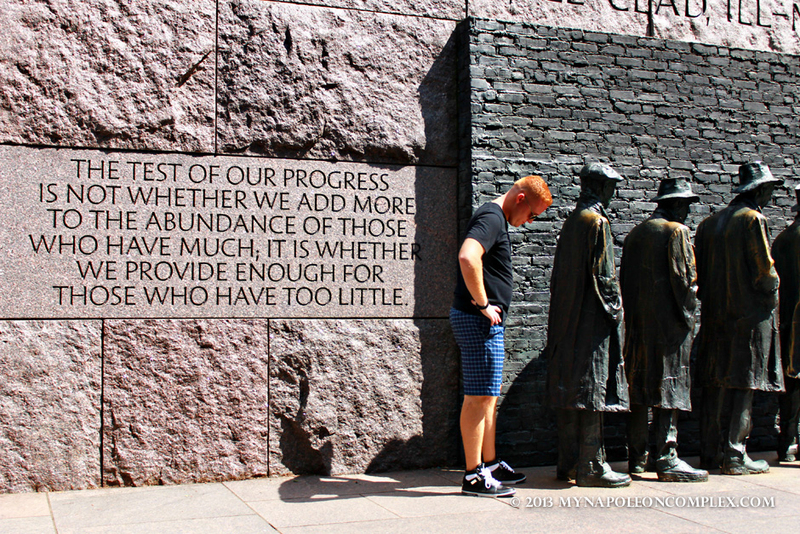 Roosevelt Memorial: Statues in unemployment line. Jaime’s brother, Juan, posed for us at the end. 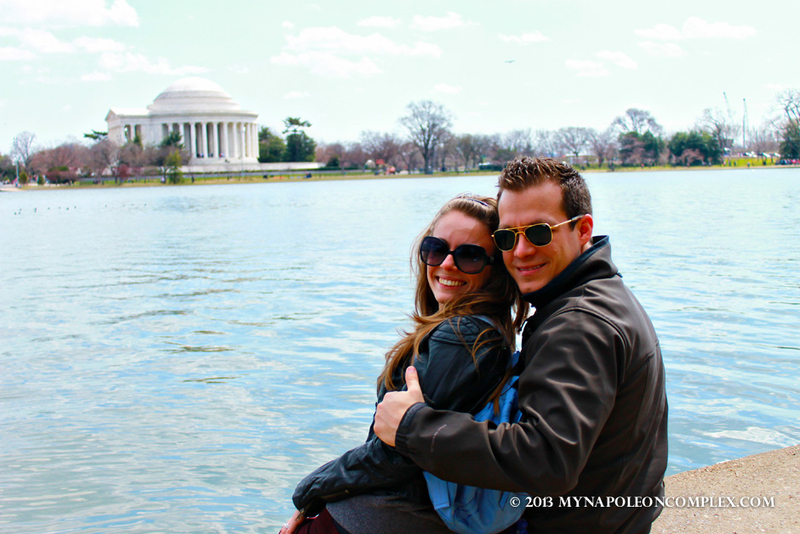 Jaime & I from the opposite side of Tidal Basin, near the Roosevelt Memorial. 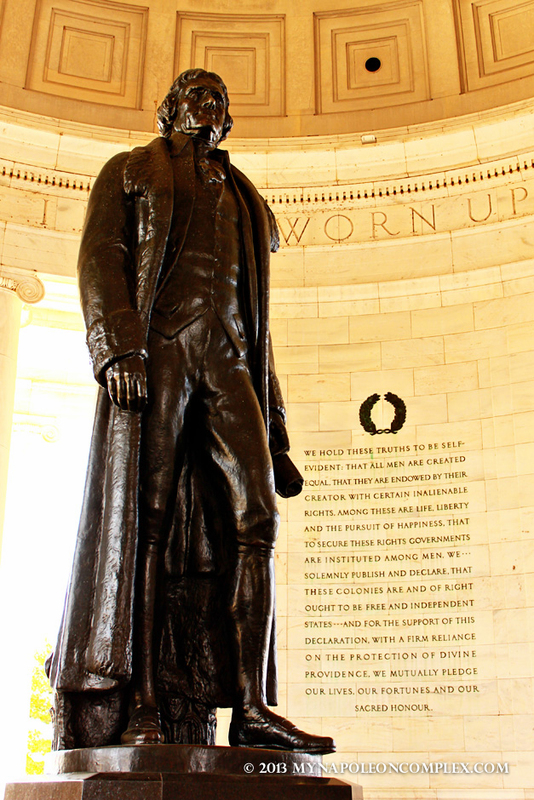 Thomas Jefferson with a very famous quote in the background. Wonder where I’ve heard that before? Update (2015): I added some of my favorite pictures from other times we visited the memorials after this.